Stress impacts our health and happiness. Whether it’s belly fat, acne, infertility, anxiety, or fatigue, it may be a sign from our body that we need to pay attention to what stress is doing to our hormones. When I was trying to conceive my first I focused on getting the right pre-natal vitamins and getting into shape. It wasn’t enough so I focused on my diet and things really started to turn around in my hormones. The biggest shift however was when I focused on reducing my stress. I have since been mindful of stress and ways to help avoid it impacting my health and happiness, even though stress has not gone away. 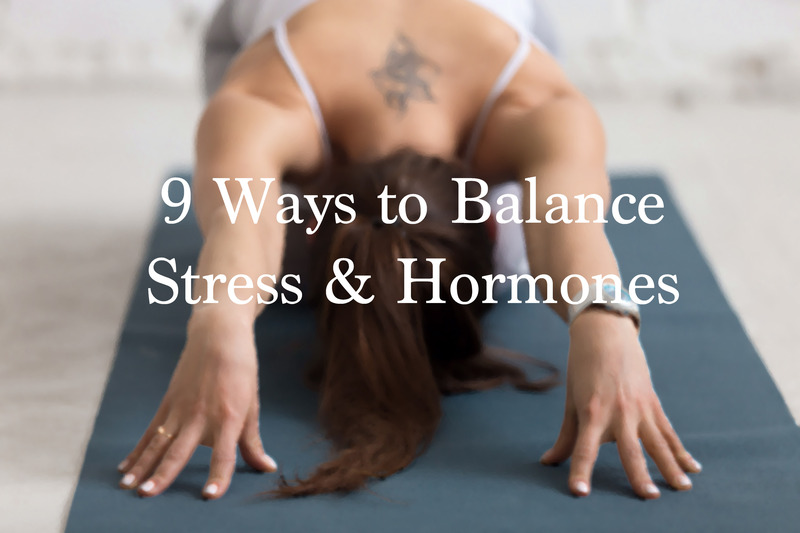 If you have a life of high stress and are having any of these symptoms it may be worth looking into ways to balance the effects of stress on your hormones. Stress is a natural part of life. When our body senses a stress our body reacts, like in primitive time, as if endangered by a tiger. This triggers the shift from being in a state of “rest and digest” to the “fight or flight”. These are also known as the parasympathetic and sympathetic nervous systems respectively. Fight or flight response sets off a series of events in the Hypothalamic-Pituitary-Adrenal (HPA) Axis. Starting in the hypothalamus our body releases corticotrophin releasing factor (CRF) which then stimulates the release of adrenocorticotropic hormone from the pituitary gland and then downstream release of cortisol from the adrenals. How does cortisol rise and what does it do? Cortisol triggers a reaction that gets our heart pumping, glucose into our blood and our nerves activated while shutting down secondary systems such as digestive, immune and reproductive. This response is needed for survival, healing cuts, infection, etc. The challenge is we are programmed to react to all stressors including injury, traffic, deadlines, playing out scenarios in our head, caffeine, working out too much and even being lonely can trigger stress. What’s the impact to hormones and health? Overeating: Stress decreases leptin, our satiety hormone, which leads to an increase in the hunger hormone ghrelin. This triggers an increased appetite. Diabetes: Stress increases blood glucose levels and is meant to provide energy to respond to stress. Sitting and worrying in traffic or on the sofa can leave this glucose roaming in the blood. Belly Fat: A combination of high glucose and cortisol triggers the conversion of sugar into fat that’s shunted into our abdominal region (because visceral fat has more cortisol receptors). Low Thyroid: Stress impairs production of thyroid simulating hormone (TSH) and the conversion of T4 to the active T3 form. This can cause fatigue, poor memory, weight gain or cold extremities. Infertility: Low TSH and low Gonadotrophin Releasing Hormone(GnRH) impair our reproductive functions of the ovaries and testes. GnRH regulates cycles and follicle and lining development (through FSH and LH). Early Aging: Lower levels of our anti-aging hormone DHEA, which keeps us feeling good and is a precursor to other hormones. When the adrenals make more cortisol they make less DHEA, increasing the risk of adrenal fatigue and depression. Burnout: When adrenals work against the battle of stress, it can be too much after some time. At this point, even cortisol drops and we suffer in different ways. We lose momentum to do the things we want to, even getting up out of bed. This is also a time we are more vulnerable to depression. What can we do to help support our bodies, because the stress is not going away anytime soon. Stress is a normal part of life and it’s not about to disappear anytime soon. Stress management is tricky if you are in a phase of life that naturally has more responsibilities and pressures. This is why I focus on stress perception, which is your outlook on the stress. You can freak out in traffic or accept it, either of those reactions won’t get you anywhere sooner, but accepting it will help your health. You may even explore ways to use the time in a way that you enjoy it – such as listening to a podcast. There are natural ways to help support our body with nutrients and movement to help counter balance the stress impact. Mindfulness: Absolutely the biggest factor. How you perceive stress dictates your body’s response. If we constantly fear the worst, replay situations, think ‘FML’, it amplifies a state of chronic stress. Step back and get perspective and ask yourself mindset questions like: Is this true, what’s the worst that can happen, what am I grateful for and what matters most to me. Eat healthy fats: Cholesterol is made in our body primarily but can also be consumed. Cholesterol is important as it is the building block of all steroid hormones. This means we need cholesterol for progesterone, testosterone and estrogen. Take your omega 3’s: Our bodies thrive when there is a balance of omega 3 and 6. Today’s environment promotes high omega 6 levels that most often require supplements to get the right balance. Fish/cod liver oils and some vegan options are available to help achieve balance. Yoga & Qi Gong: Movement is important, keep it gentle and avoid added stress from exercise. Many poses, such as child’s pose, promote the rest and digest state. Qi Gong promotes energy movement through the body and has been linked to lowering levels of cortisol and promote hormone balancing. Eat your B vitamins: Stress takes up many minerals, especially the Bs as they are often touted as stress vitamins and can plummet fast when stress is high. This impacts our energy and our mood as B vitamins are critical to our neurotransmitter functions. B’s are easy to cover off through a whole foods diet including some broccoli, spinach, eggs, chicken and lentils. Shorter workouts: Exercise for 10 to 20 minutes and do it in the first half of your day if possible – after 15 minutes cortisol begins to rise and it will remain high for about 100 minutes. We want our cortisol to move into low point at midnight so that our hormones can all reset. If you find yourself wired and tired at night, avoid evening workouts. Less caffeine: Caffeine increases cortisol. Consider green tea or matcha tea as they have some caffeine but also have protective properties from stress itself. Supportive herbs: There are adaptogen herbs such as ashwaganda, rhodiola, cordyceps and others that can have a supportive nature. Work with a practitioner to get the right one and amounts and use to supplement whole foods diet to support periods of high stress. Get restful sleep: Try to hit the bed before midnight, when cortisol resets to it’s low point and melatonin kicks. Reduced sleep can trigger hormone imbalances, weight gain and fatigue. Maximize sleep and melatonin levels by keeping the room dark and cool. And turn the cell off (or on airplane mode). Remember, that to start making changes, the first step is to make your health a priority. Having the belief that you care about your health first and foremost, will help making these changes much easier. Pay attention to how these impacts to your health and ask yourself if it’s not worth making changes. Stress is not going away, it’s time to support yourself and get in the best mindset to deal with it with ease. Khush Sra is a Toronto based holistic nutritionist that specializes in mindfulness and nutrition for women. Having healed herself from endometriosis, hypothyroidism, infertility, corporate burnout and having supported her mom through a battle with stage 4 cancer, she has practical real life experiences with how holistic nutrition can improve our health and happiness. Khush has 3 children she has raised on a whole foods, plant based diet and helps women who are looking to improve health, wellbeing through food and mindfulness. Khush runs a FREE 10 Day RESET PROGRAM for women looking for an energy boost or to get back on track. Sign up today!